Oprah Winfrey has just released a statement stating that Gov. Sarah Palin, the republican Vice Presidential nominee, will not appear on the Oprah Winfrey show. 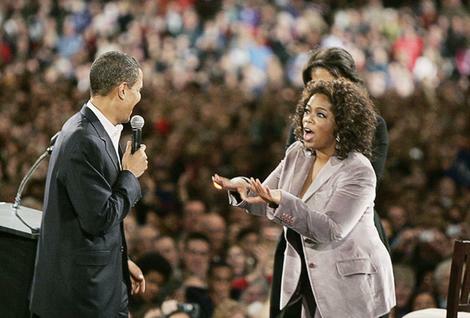 If you’re a republican woman, don’t help Oprah use her celebrity to help Obama. Stop watching her show today, and show her that you do not appreciate her bias. Write to her at Harpo Studios, and tell her if she is going to cover politics that she should cover both sides or you’ll take your advertising dollars elsewhere. Oprah’s statement was in response to a story on the Drudge Report earlier in the day, stating that certain staff at Harpo Studios were in disagreement on whether to book Gov. Palin on the show. Barak Obama was a guest on the Oprah Winfrey show prior to announcing his intention on running for the presidency. Ms. Winfrey has publicly endorsed Obama and actively campaigns with him. In my opinion, the reason that she claims to not want to use her show as a platform for politics, is that she has already made her choice, he has already made his appearance, and she understands that she would have to give (at least the illusion) of equal time and coverage on her show or she could face backlash from her primarily female audience. Palin would be a great guest and is an inspiration to all American women regardless of party affiliation. To host a guest as historically significant as the first woman republican nominee for Vice President, Oprah should put aside her party bias and invite Sarah Palin as a guest. To do otherwise, appears racist or at a minimum politically biased, either of which is certain to draw away large numbers of her viewers. If she truly cares about her female audience, she owes it to herself and her audience to book Sarah Palin on her show. Just for good measure, she should also be allowed to host her close friend Barak again, so as to not appear unfair. Actually, I just don’t want to hear the whining from the left.